In a saucepan, cook the sausage over medium-high heat until crisp. Using a slotted spoon, transfer the sausage to a dish with paper towel and set aside. Add the onion and cook until soft, about 3-4 minutes. Add garlic to the on-ions and cook for an additional minute. Add corn and stir. Continue to cook for a minute and then add the broth. Add the cream, chili powder and cumin. Allow the soup to boil and then reduce heat to low and cook for 10 minutes. Season with salt and pepper to taste. Serve immediately with cooked chorizo, cheese, and cilantro. Add bacon and jalapeño for a different version. These last few weeks I’ve been testing out new recipes and when I’m very busy what I miss most is a simple soup with tons of flavor. Today I share with you a very easy recipe with a sweet corn base. This is a quick, easy and tasty soup! Serve with a green salad and enjoy dinner in just 30 minutes. 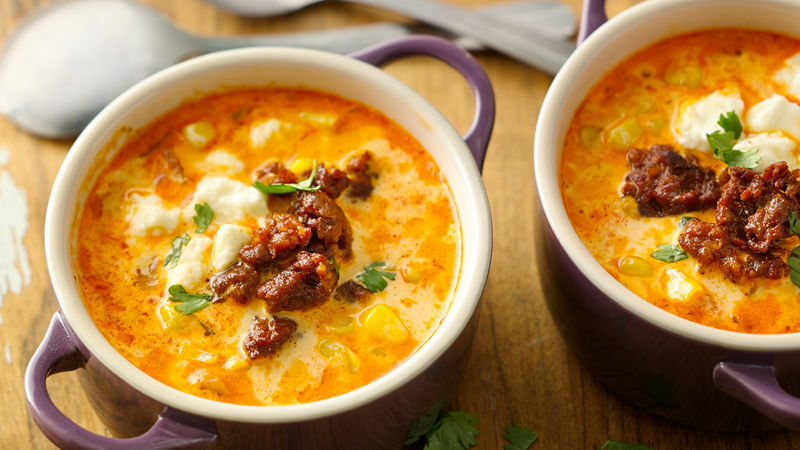 This sweet corn soup with chorizo and queso fresco has the perfect combination of flavors and textures, sweet, spicy, cream and savory all in one spoonful.